This year, Yukon’s premiere bird festival will take place April 16-24, 2011. Last year broke all records as nearly 2500 Trumpeter Swans arrived at Marsh Lake and M’Clintock Bay in time for April’s Celebration of Swans. Each year, the festival brings residents and visitors alike out to great swan viewing areas. Yukon’s Trumpeters spend the winter in British Columbia and return north as the lakes thaw. Many of the events take place at the impressive Swan Haven Interpretation Centre 30 minutes south of Whitehorse (867-667-8291). 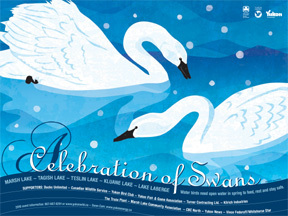 Keep current on plans for this year’s festival at Environment Yukon’s: Celebration of Swans website. Hello artists! It’s time once again to search for a great image for the 2011 Celebration of Swans poster. Every year we print hundreds of these posters and they go up in homes and businesses all over the territory (and some around the world!). They have become a collectible item and Yukon Gallery estimates about 2 dozen come in each year to get framed! If you have any swan- or spring-related art you would like to submit to this year’s contest, I would love to see it. The deadline is February 11th – FIRM – and all mediums of art are accepted. Just take a high quality picture of your piece and send it to me and I will print it out for our judges to see.